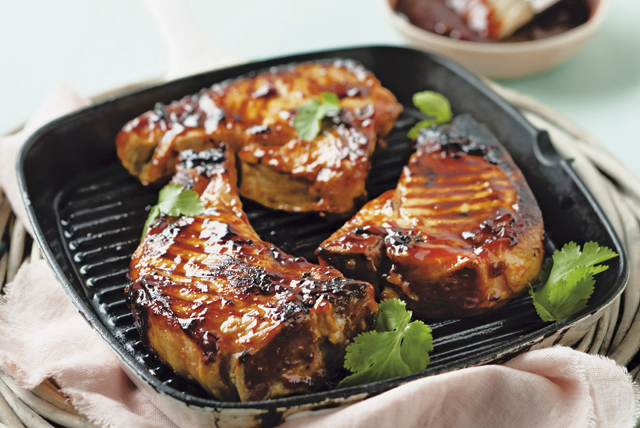 The sweet and savoury flavour combination of cranberries and barbecue sauce is the perfect complement to these delicious skillet pork chops. This simple recipe is sure to become your new go-to favourite. Bring barbecue sauce, cranberries and sugar to boil in medium saucepan on medium-high heat, stirring occasionally; simmer on medium-low heat 5 min., stirring frequently. Reserve 1/2 cup barbecue sauce mixture. Heat large skillet sprayed with cooking spray on medium-high heat. Add chops; cook 4 to 5 min. on each side or until done (160ºF), brushing with remaining barbecue sauce mixture for the last few minutes. Serve chops with reserved sauce. Serve with a side salad made with arugula and sliced seeded cucumbers tossed with Kraft Zesty Italian Dressing. Garnish with 1/4 cup chopped fresh cilantro before serving.